The spa gardens have their origin in the avenue with double rows of linden trees, which was laid out by prince bishop Ferdinand von Fürstenberg in 1669. An avenue at right angles to this was added at the beginning of the 18th century. Today these two avenues still determine the basic structure of the park, the mineral spring being located at the point where the two avenues meet. The creator of the spa complex was Caspar Heinrich von Sierstorpff who, in the spirit of enlightenment, made Bad Driburg a place of “rural pleasure”. To the west of the spring he realised the first landscaped park. Views of the Egge Mountains remove the border between the formalised areas and the surrounding landscape. Winding paths were created on the Rosenberg with a view to beautifying nature and shrubs and trees were also planted there. The spa complex underwent constant expansion under von Sierstorpff’s successors. Towards the end of the 19th century the park was enlarged towards the south. This area still impresses the visitor today with the broad curves of its paths, its lawns and solitary trees. The lake with the “Diotima” island forms the highlight of the area. A notable feature of the park is the planting of the flowerbeds, which changes throughout the course of the year. Since summer 2009 the park has a new attraction: a new garden with herbaceous plants and grass, designed by Dutch Piet Oudolf, runs like a river in bloom through the landscape park. The foundation stone for the Driburg spa was laid by the prince bishop of Paderborn, Ferdinand von Fürstenberg (1661 – 1683), when he had the mineral spring at Driburg contained and an avenue with double rows of linden trees laid out. Today, this mineral spring is known as the Rabe source (main source). Later, a further avenue was added in a southern direction and these two avenues still determine the basic structure of the complete spa complex today. Prince bishop Clemens August was responsible for its further extension when he had an octagonal pavilion built over the spring in 1743 as well as a packing house for dispatching the water. But it was with Caspar Heinrich von Sierstorpff (1750 – 1842) that Bad Driburg became established as the leading spa for the educated upper classes. Sixteen half-timbered buildings were built or reconstructed during his sixty years of activity. It was his wish that the Bad Driburg complex should become a place of “rural pleasure”. To the west of the main spring he created the first landscaped spa gardens, where visitors could walk and rest, thereby lending support to the curative effects of the mineral water. The landscape was included, with sweeping views of the surrounding Eggegebirge removing the borders between the formalised garden complex and the natural landscape. Winding paths were created on the then unwooded Rosenberg with the intention of beautifying Nature and various groves were also planted there. Continual extensions and changes also occurred after Caspar von Sierstorpff. Towards the end of the 19th century, the park was enlarged over a wide area towards the south. This area still impresses the visitor today – its paths with their broad curves, its well-tended lawns and impressive solitary trees. The highlight is the “Hölderlin Grove” (Hölderlin-Hain) and the lake with the “Diotima” island facing it. They are dedicated to Friedrich Hölderlin and the Frankfurt banker’s wife Susette Gontard whom he loved and whom he revered in his writing as Diotima. Both visited Bad Driburg in 1796. 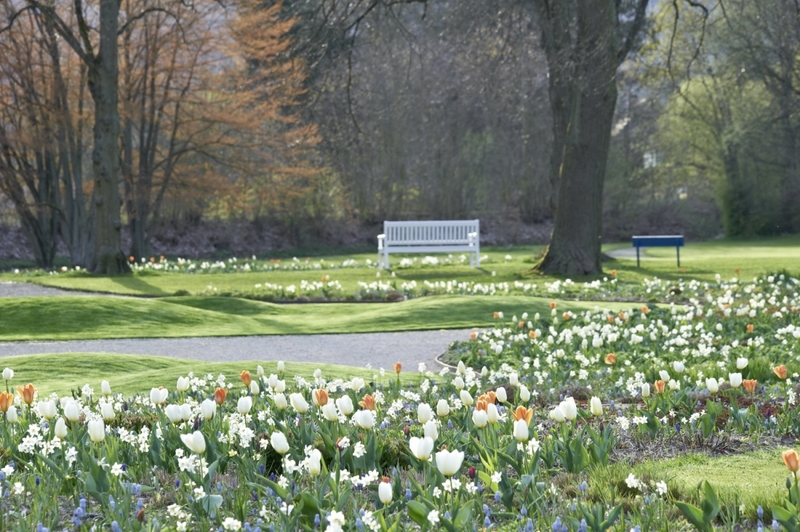 During the period between the two world wars, a rose garden was laid out and the oldest area of the park at the main spring was redesigned with geometrical and landscaped elements. After the second world war, the gardens southwest of the major linden avenue were further enlarged by about a third. The small garden temple at the lake and the garden bridges inspired by historical models were constructed by Countess Ramona von Oeynhausen-Sierstorpff (1928 – 2003). To the north of the pump room one finds a temporary finale in the form of a formal hedge garden of hornbeams and a fountain for quiet contemplation by the English sculptor Angela Conner. This “objet d’art” is moved in various directions by the force of the water alone. The extremely careful planting of the flowerbeds is of particular note. The first highlight occurs when the tulips come into flower and this is followed by the summer planting, which ensures a continuous sea of blossoms in harmonising colours. The Bad Driburg spa complex is still charmingly dominated today by the two avenues which run up to the source. They are planted with linden, oak and chestnut trees and also feature half-timbered buildings. The artist Gilles Clément alluded to this during the spatial creations of 2001 when he used baby’s breath (gypsophila), cosmos (cosmos) and blazing stars (liatris) to create a planted arrangement which altered the central axis to the pump room. An element of natural wildness enriched the existing architecture, continuing with irises in a fountain and lilies in a lawn. The white blossoms represented the translation into plant form of the bubbling element of water. Tony Ourseler’s 2002 “shock-rock” creation with its video projections onto oval forms, on the other hand, dealt with human perception and thought. It was presented in the historical concert shell as a combination of video projections with theatrical monologues and sculptural installations. Driburg is a place of artistic interpretation by means of garden culture and architecture, by means of literary descriptions from its many famous guests. “We lived under glorious mountains and woods and determined the best circle amongst ourselves” wrote Friedrich Hölderlin to his brother from Driburg in 1796. Broad avenues invite the visitor to linger. The 18th-century bathhouses bear witness to a period when the value of strolls and leisure was appreciated. Hölderlin spent just a few happy weeks with Susette Gontard, the “Diotima” of his poetry, in Driburg. His life was marked by constant departures, farewells and arrivals only to depart again: being en route as an expression of thinking and living, en route towards greater freedom, more beautiful humanity, towards the greatness of Nature. The readings and concerts here promise to pay homage to Hölderlin, to his lyrical elegies and reproaches but also to the density of his poetic language and its great musicality. The feelings of affinity linking Friedrich Hölderlin to Michael Hamburger or to the Arabic poet Fuad Rifka, who travelled 6,000 kilometres to give a reading in the place where Hölderlin found love, stretch over great periods of time as do those linking Beethoven to Luigi Nono and György Kurtag. Driburg and its extensive surroundings – Teutoburger Wald, the Knochenberg, the mineral sources, mills and glassworks – were expressed in poetic language by Hölderlin. When the reader comes here: to the avenues, the woods, the valleys of this area, he may well have a similar experience to Hölderlin: the places remind him of the literature written about them. When we rediscover images of the Driburg landscape in Hölderlin’s poems, the image of this landscape also changes for us and when we arrive here we may even be fortunate enough to recall the literature written about it – a verse, a stanza, a line. Then a piece of art and literature has become part of everyday life. WC: at various locations, adapted toilets within buildings.